With the death of Qurayshi leaders such as Abu Jahl, Utbah, Shaiba, Walid, Umayya bin Khalaf, and Hanzala bin Abu Sufyan, leadership of the Meccans had passed on to, Abu Sufyan, the chief of the clan of Banu Umayya. There was profound sorrow in Mecca but Abu Sufyan had forbidden the bereaved families to cry and to lament their losses and had taken an oath to avenge the defeat at Badr. The battle of Uhud was a reprisal against the Muslims following the battle of Badr. One year after the battle of Badr, the new army of Mecca was ready against the Muslims. In March 625 Abu Sufyan left Mecca with three thousand seasoned warriors. Also accompanying the army, was a band of women singing amatory songs to encourage the troops and to stop the army from fleeing. These included the wives of Abu Sufyan and Amr bin Aas, and the sister of Khalid bin Walid. Hind, the wife of Abu Sufyan, made the suggestion that the body of Mohammed's mother should be exhumed and kept as hostage; but the Quraysh rejected this suggestion for fear of reprisals. Abu Sufyan placed Hubal, the idol that the Bani Umayya worshipped, on a camel, and carried it with him into the battle to boost the morale of the idolaters.Meccan banner was borne by Talha son of Abd al Ozza. The right wing was commanded by Khalid; the left by Ikrima son of Abu Jahl. The Muslims advanced with 700 men against 3000 warriors from Mecca. Moreover, while the Muslims could muster only one hundred men with coats of chain-mail, and no horses, Quraish and their allies included 700 men in armor and 200 horsemen. Wishing to cover their rear in view of their small numbers, the Muslims posted themselves at the foot of Mt. Ohad. Their right flank and rear were covered by the mountains, but their left flank lay in open ground and was thus exposed to a charge by the enemy cavalry. To guard against this, Mohammed posted fifty archers on this flank, with orders on no account to leave their post, from which they could protect the Muslim left wing from the Quraish horse. The Meccans drew up their line facing the Muslims in such a way that the latter, with their backs to Ohad, were facing Medina, while the Quraish line confronted them with Medina in its rear, thereby interposing between the Muslims and the town.The battle of Uhud began just as the battle of Badr had begun, with a Meccan warrior advancing from his lines and challenging the Muslims to single combat. Talha ibn Abu Talha, carrier of the Meccan flag, sprang forward asking the Muslims to duel with him. Ali ibn Abi Talib advanced forth to fight with him. The encounter was soon over as Ali struck his enemy a single fatal stroke. Exalted, the Prophet and the Muslims yelled, "Allah is Great." When Ali ibn Abu Talib killed the carrier of Meccan flag, Talhah ibn Abu Talha, it was immediately raised again by Uthman ibn Abu Talha. And when Uthman fell at the hands of Hamzah, it was raised again by Abu Sa'd ibn Abu Talhah. At the moment he raised the Meccan flag he shouted at the Muslims. "Do you pretend that your martyrs are in paradise and ours in hell? By Allah, you lie! If anyone of you truly believes such a story, let him come forward and fight with me." His challenge attracted Ali who killed him on the spot. The Banu Abd al Dar kept on carrying the Meccan flag until they lost nine men. Ali, the young lion, alone had killed eight standard-bearers of the idolaters of Mecca. After the death of the ninth of his standard-bearers, Abu Sufyan ordered his army to advance and to attack the Muslim formations. When the Prophet noticed the enemy moving, he also alerted the Muslims. He held a sword in his hand, and offered it to anyone who would bring honor to it. Some hopefuls moved toward him to take it but he withheld it from them. Umar got up to take it, saying: "I will take it with its right," but the Prophet turned away from him and brandished it a second time using the same words. Then Zubayr b. al-Awwam got up and he too was rejected, and the two of them were much mortified. The Prophet gave the sword to Abu Dujana, an Ansari. He took it and used it as it ought to have been used. He justified the confidence his master had placed in him. Perched on the summits of many camels were little huts, or howdahs, in which rode a squadron of women well trained by Hind to sing warlike ballads that would keep their menfolk in a fever pitch of rage and discourage cowardice. The Meccans, generously assisted by the women who had brought their timbrels, flung insults at the Moslems. These were alternated by Hind, the wife of Abu Sufyan, who led triumphant choruses as she danced round the idol which perched on the camel. Despite the prominent position of Abu Sufyan, there are many tales of love and passion involving his wife with other men without implying any stain on her reputation..."
Hind had brought with her from Mecca, a certain Wahshi, an Ethiopian slave, to kill Hamza, and had promised to give him not only his freedom but also much gold, silver and silk in the event of his success. He was noted for his skill in the use of the javelin. The charge of Ali, and Abu Dujana spread panic in the ranks of the Meccans who now began to flee. Not far from them, Hamza, was busy hacking his way through the dense mass of the enemy. Between them, they were grinding the army of Quraysh. Wahshi hid behind a rock awaiting an opportune moment and when it came, Wahshi stood up, took deadly aim, and hurled his javelin at Hamza. The javelin caught Hamza in the groin. He fell on the ground and died almost immediately. There was confusion in the army of Mecca and the Muslims assumed that they had already won a victory. In great anxiety to plunder the enemy, they forgot their discipline. The archers who had been posted by the Prophet at the strategic pass, also imagined that the enemy had already been beaten, and was in retreat. Against the express orders of the Prophet, they descended into the plain below to capture their share of the booty . Their head, Abdullah ibn Jubayr, ordered them not to abandon the pass but they paid no attention, and descended into the valley. Their love of booty cost the Muslims victory in the battle of Ohad! A Meccan general, Khalid bin al-Walid, noticed that the strategic pass to the left of the army of Medina was unguarded. He immediately seized the opportunity to attack the handful of the pickets still at the pass, with his cavalry. The pickets fought bravely but all of them including Abdullah ibn Jubayr were killed. Once Khalid captured the pass, he attacked the army of Medina from the rear. The army of Medina was busy in gathering booty and it was startled by the charge of the Meccan cavalry in its rear. Abu Sufyan also regrouped his troops and launched a frontal attack upon them. The now found themselves caught in a pincer movement of the enemy, and they panicked. The panic was not confined merely to the lower ranks of the Muslim army. Some of the leading companions of the Prophet were also carried away with others before the charge of the enemy. Among the fugitives were both Abu Bakr and Umar. Abu Bakr said in later times that when the Muslims fled from the battle of Uhud, and left the Messenger of Allah, he was the first one to return to him. Umar often said that when the Muslims were defeated in Uhud, he ran and climbed up a hill (Tabari, History, vol. IV, p. 96). Uthman bin Affan, the future third khalifa of the Muslims, had not taken part in the battle of Badr but he was present in Uhud. However, he found the clangor of sword and spear a little too much for his nerves, and was among the first fugitives and though he fled from the battle-field, he did not enter Medina. As the Muslims ran past the Prophet, he tried to stop them but no one seemed to listen. In a short time the tables were turned on them, and victory was wrenched out of their hands. It was the price they had to pay for their disobedience to their Prophet, and for their obsession with gathering booty. The Prophet had given the banner of Islam to his uncle, Masaab ibn Umayr, in the battle of Uhud. He was killed by the enemy, and the banner of Islam fell on the ground. When Ali noticed the banner falling, he rushed forward, picked it up, and raised it high once again. As Mosaab resembled the Prophet in person, a notion was put up by the enemy that Mohammed was slain. Those who thought that Muhammad had perished, including Abu Bakr and Umar, went toward the mountain and sat down. Most of the Muslims had fled from the battle-field but Ali was still fighting. He was carrying the banner of Islam in one hand, and the sword in the other. The Prophet, however, was in another part of the battlefield. He had been wounded, and his head and face were bleeding. A few Muslims, mainly the Ansar, were defending him. It was this little group, and its battle cries that caught Ali's attention. He tore his way through the enemy lines and came up to his comrades-in-arms. They stood surrounding the Prophet, and led by Abu Dujana, were doing the best they could to shield him from the missile weapons of the enemy. The idolaters had renewed their attacks, and now it was Ali who had to beat them back. They charged repeatedly but he repulsed them each time. In the battle of Uhud, many of the companions who were touted to be very brave and faithful, turned their backs upon the enemy, and ran for cover. But there were some who displayed exemplary courage.Umm Ammarra Ansariyya, a lady from Medina,was one such personality. She was noted for her skills as a surgeon and a nurse, and came to Ohad with the army of Medina. At the beginning of the battle, she brought water for the soldiers or tended them if they were wounded. But when the Muslims were defeated and they fled from the battle-field, her assumed the duty of a warrior. At one time the enemy brought archers to shower arrows upon the Prophet. Umm Ammarra seized an enormous shield and held it before him to protect him. Shortly later, the Meccans charged with swords and spears whereupon Umm Ammarra attacked them with a sword. One idolater came dangerously close to the Prophet but she came in front of him, and took the blow fell upon her shoulder. Though she was wounded, she resolutely stood between the Prophet and his enemies, defying them and defying death. Taking advantage of a momentary lull in fighting, Ali took the Prophet away from the danger spot to a ravine where he could get some rest, and where his wounds could be dressed. Fatima Zahra, the daughter of the Prophet, came from the city with a group of Muslim women when she heard the news of the defeat of the Muslims. Ali brought water in the hollow of his shield, and Fatima Zahra washed blood from the face of her father, and dressed his wounds. After the first shock of defeat had passed, some of the Muslims returned to the battle-field. Abu Bakr and Umar were among them. They also went into the ravine where Ali had taken the Prophet. At this moment, Abu Sufyan who was ready to return to Mecca, is reported to have come near the ravine. Standing at the foot of the hills, he exchanged a few remarks with Umar. When Abu Sofian asked Umar ibn al-Khattab if Mohammed were dead, he had replied, "No, by Allah, he can hear you speaking." But it never occurred to Abu Sufian to take advantage of this dangerous breach of security whereby he could have climbed Mount Uhud at the cost of a few casualties and possibly killed the Messenger of Allah. Abu Sufian talks familiarly with Umar ibn al-Khattab on the battle-field of Uhud, for neither had killed a relative of the other. But Abu Sofian's wife, Hinda, the daughter of Utba ibn Rabia, mutilates the dead body of Hamza, who had killed her father.The Quraysh salvaged their honour by defeating the Muslims and left the battle-field. But the Prophet, still not sure about their intentions, sent Ali to watch them from a distance. 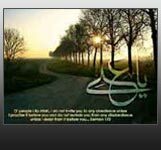 Ali returned and informed the Prophet that the Quraysh had bypassed Medina, and were moving toward Mecca. The Muslims then descended from the hill, prayed over their dead, and buried them. It was a most critical moment in the history of Islam. The idolaters charged upon the Messenger of Allah like furies but each time they were repelled by the edge of the Dhu'l-Fiqar. If Ali too had failed in his duty as many others did, the idolaters would have killed the Messenger of Allah, and they would have extinguished the flame of Islam. But Ali and a handful of other Muslims, including Abu Dujana and Umm Ammarra Ansariyya, averted this catastrophe. In this lamentable battle, 75 Muslims were killed. Out of them four were Muhajirs, and the rest were Ansars. The most tragic episode of the battle of Uhad was the death of Hamza and the mutilation of his body. After the departure of the Meccans, the Prophet went to see the corpse of his uncle. The ears and the nose had been cut; the abdomen had been slit open, and its organs had been removed. He was overwhelmed with sorrow to see the martyr's body in that state, and ordered it to be covered. When the Prophet returned to Medina, he heard the heart-rending lamentations of the members of the bereaved families. He exclaimed: "Alas! there is no one to mourn the death of my uncle, Hamza." The leaders of the Ansar, upon hearing this remark, went to their homes, and ordered their women to go to the house of the Prophet, and lament the death of his uncle. A crowd of women of Medina gathered in the house of Muhammad, and they all wept over the tragic death of Hamza, the hero of Islam. The Prophet invoked the blessings of Allah upon them all. Thereafter it became a custom in Medina that whenever anyone died, his mourners began their lamentations with dirges on Hamza.